After the high mountain spruce-moss ecosystems of Great Smoky Mountain National Park, today's hike (Tuesday 13 March, 2012) brought me back to lower elevations and the familiar mixed hardwood forest. It was as comfortable as an old glove, and the weather turned downright summery after a foggy morning. Southbound from Fontana the trail climbs side-slope, bringing you into view of the river below Fontana Dam and of the Dam itself. 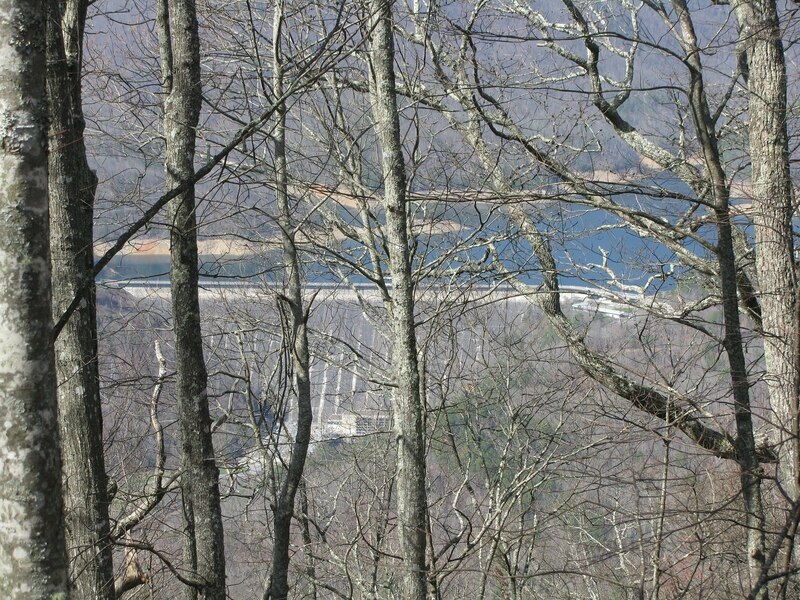 After a 2000 foot climb to the ridge called Bee Cove Lead, the views of the Dam and lake continue. These view are almost continuous, but always obscured by trees - in summer there may be little to see. Never does the trail come to a decent viewpoint, though I found myself begging for one. 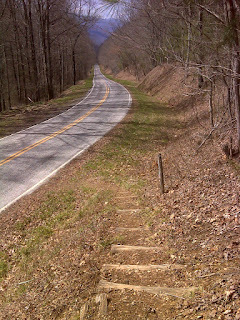 Then, very abruptly, the AT plunges down off the south side of the ridge, and says good bye to Fontana Lake forever. 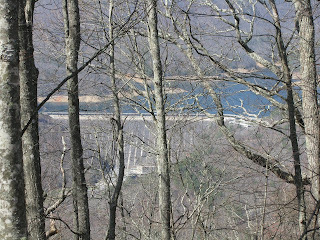 For the NoBo thru-hiker this sudden first view of the lake and dam (albeit shrouded by trees) has to feel like a landmark moment. Southbound, the trail follows a spur ridge briefly then switches back and descends side hill via a long traverse to Cable Gap Shelter a vintage 1939 shelter made of huge logs. 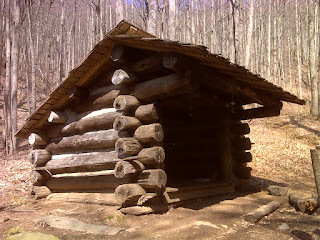 There I met four hikers stopped for lunch: a father-son team out for a three day trip - the father was carrying the same model GPS as mine, so we compared notes - and a young thru-hiker named 'Drop Out' and his erstwhile hiking buddy who was headed only as far as Hot Springs. The conversation with these two lasted quite a while. Mostly we shared our experiences with trail the other had not yet traveled. They were fun to chat with. From the shelter it's just a hop and a skip to Yellow Creek Gap. 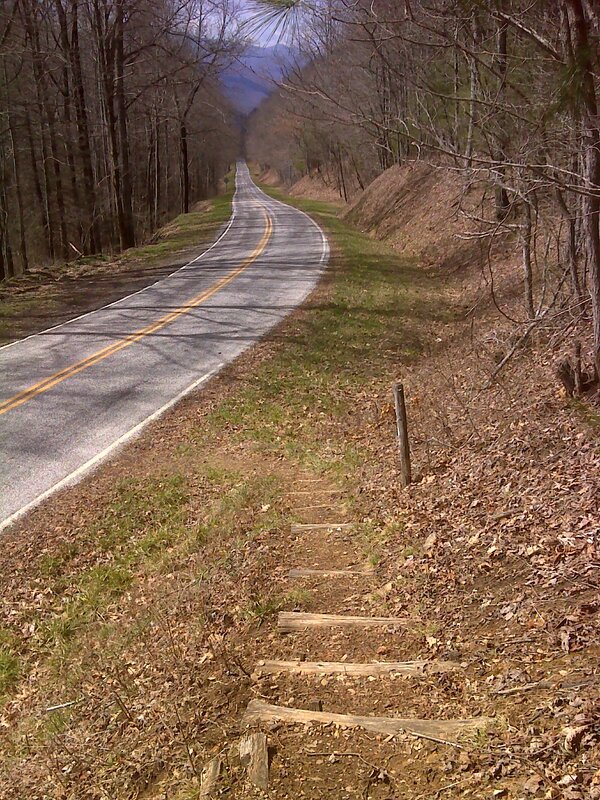 I went a half mile beyond that landmark, turning around at a saddle after a steep climb. The full afternoon heat bore down on my return journey - it got close to 80 degrees! The bugs are out, the buds are swelling, and back in civilization the forsythia are in full bloom. Judging from the long term forecast, it may be a quick spring. The upcoming weather pattern looks like a July pattern - I think I've seen the last of the snow and ice, and good riddance!